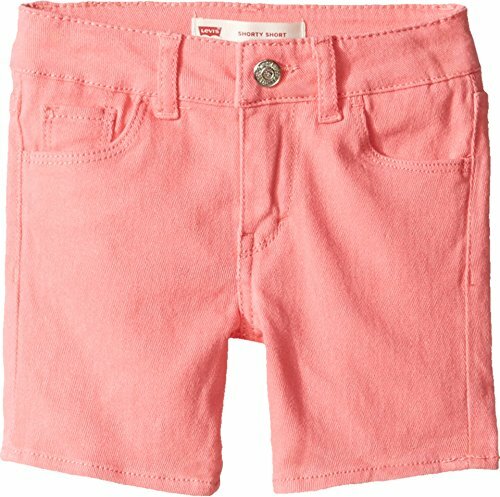 Let the sun shine and doll her up in the Levi's® Kids Summer Love Midi Short! Midi Shorts feature a stylish slim cut and easy mid-thigh length. Raw edge finishes the fixed roll-up cuff. Lovely heart-shaped coin and back pockets. Lightweight and breathable stretch denim. Glitter-enameled rivet and shank button hardware. Signature arcuate stitch at back pockets. Leather brand patch accents the back waist. Five-pocket design. Belt-loop waistband. Zip fly and button closure. 55% ramie, 43% cotton, 2% spandex. Machine wash and tumble dry. Imported. Measurements: Waist Measurement: 20 in Outseam: 9 in Inseam: 2 1⁄2 in Front Rise: 6 1⁄2 in Back Rise: 9 1⁄2 in Leg Opening: 12 in Product measurements were taken using size 2T (Toddler). Please note that measurements may vary by size. Let the sun shine and doll her up in the Levi's® Kids Summer Love Midi Short! Midi Shorts feature a stylish slim cut and easy mid-thigh length. Raw edge finishes the fixed roll-up cuff. Lovely heart-shaped coin and back pockets.